Can you appreciate a book without particularly liking it? That was my reaction to Kazuo Ishiguro’s 2005 speculative or experimental or science-fiction novel (read the review then pick your adjective), Never Let Me Go. Never Let Me Go focuses on three characters – Tommy, Ruth, and the novel’s narrator Kathy H. – who are students at what seems to be an upscale private school called Hailsham in what seems to be England in the 1980s. But something isn’t quite right. The disquiet begins with the first chapter in which an adult Kathy talks about her work as a “carer” for “donors”. The story quickly returns to Kathy’s childhood at Hailsham where the students are only taught art, where the teachers are called “guardians”, and where not only are parents and the outside world never mentioned, but where they seem to barely exist. As it turns out, there is a good reason for all these strange facts. The students of Hailsham are clones who are being raised to adulthood for the singular purpose of providing organ donations to “normal” men and women. The last donation is fatal. And with that realization, we follow Ishiguro down his rabbit hole, and pop up in the world of Kafka or Beckett (as other reviewers have well noted before me); but unlike the fantastical worlds of Gregor Samsa’s middle-class family apartment, or Vladimir and Estragon’s desolate country road, the world of Never Let Me Go never quite achieves a coherent internal logic. Which means I don’t think the novel is an entirely successful experiment. But before I get to these objections, let me talk about what I think Ishiguro did right. Kathy H.’s narrative voice in Never Let Me Go is cool – even cold – dispassionate, and elusive. She leaves an enormous amount unsaid about the feelings and experiences of clone donors. They all seem to embrace their fate with a combination of resignation and acceptance. The four stages of donations are not described. Post-operative pain or complications are vaguely acknowledged, at best. Every donor dies off the page. No one knows where the bodies are buried. If they are buried. Kathy H. describes strong emotions, even in herself, with a matter-of-fact tone that prevents us from feeling them. She doesn’t seem to want our sympathy, and her coolness makes our empathy harder. But all this seems exactly right. Asking someone to remain alive in feeling who has been bred and raised like cattle; who has helped the people she loves die in the service of a society that treats them as spare parts; and who herself is now facing the same death – all that is too much. Kathy H. should be shut down as person. And if that makes our empathy harder, then it should be harder, because it is a catastrophic lack of empathy in Never Let Me Go that makes the genocidal slavery of the clones possible. And I would go further and say since any injustice committed by one human against another has as its foundation a failure of empathy, then the novel pushes us to strengthen the quality which is the solution to its (fantastical) horrors. You might think after that statement I don’t have any serious criticisms of Never Let Me Go. But I do. There are things I am more interested in than the clone thing. How are they trying to find their place in the world and make sense of their lives? To what extent can they transcend their fate? … Most of the things that concern them concern us all. We also know it implicitly because it is not just Kathy H. who responds to her fate with resignation and acceptance. Every clone responds with resignation and acceptance. If there are variations from these two emotions in the world of Never Let Me Go, we have no report of them. This is a barren and withered portrait of human life; and while it is an accurate description of some human lives, it is entirely inadequate representation of the human race I know. That race, too, strives with might and contends with blood. That race, too, loves with a fierceness that will break before it quits. That race, too, rejoices and despairs. That race, too, knows beauty as well as horror. That race, too, seethes for justice in the face of injustice. That race, too, believes beyond all reason, beyond the heavy evidence of experience. That race, too, endures and endures. Where are these lives too in Never Let Me Go? My other problem with Never Let Me Go is that I think it was a mistake for Ishiguro to situate his science-fiction nightmare in what otherwise appears to be England in the middle-late 20th century. It would have been fine if Ishiguro had transformed the premise into something more familiar: say a children’s cancer ward in which Kathy H. could have been an orphan and ward of the state, the other characters had dysfunctional families, and so on. Then Ishiguro could still have explored the things in which he says he was most interested without all the fussing with clones. Or he could have set Never Let Me Go in some dystopian alternate Earth-like world sometime in the past or future, in which it would be easy to accept the clones because that’s what happened in this world. (Think of Panem in The Hunger Games.) That would also have been fine and easy to do. How did England, barely ten years after the defeat of Nazi Germany, the exposure of the death camps, and the end of the Nurenberg Trials, transform itself from a reasonable progressive Western society – as these things go – into a moral monster? Did the rest of the Allied powers acquiesce or participate? How did England get the entire medical profession to ignore the Hippocratic Oath? Where there no objections from the religious communities? Did anyone object? Who was making money from this? Was there an underground railroad for clones? What was the system of control? As young adults, the clones seem to be able to roam at will. What stopped them from disappearing into society, where they would be indistinguishable from other human beings? Why didn’t the clones go all Rambo on the murderous bastards running the system? As an American, I can name entire states – hello, Texas – that would rise up in violent defense of themselves. How did science perfect cloning months after the discovery of the DNA double helix, but still need another 30 years to invent the Walkman? Also, I’m not a big fan of the novel of social comment, but the premise clearly suggests that our societies are capable of such actions, but doesn’t go any further with the suggestion. This combination of provocative and perfunctory doesn’t sit well. Should You Read Never Let Me Go? I can recommend The Unconsoled by Kazuo Ishiguro only to hard-core fans of Capital “L” Literature and even then, only to completists. 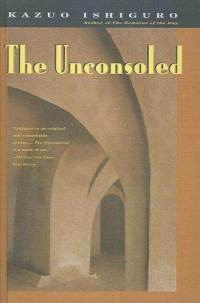 The Unconsoled follows Charles Ryder, a famous pianist, as he prepares to give a concert in an unnamed European city. Along the way, he is diverted from his preparation by a series of tedious conversations, meaningless tasks, and importunate personal requests from strangers who may or may not also be close family members or friends from his past. Both space and time seem to distort themselves around Ryder, and he has the ability to narrate events and conversations of which he can have no logical knowledge. In the end, as you might guess (I did by about page 23), Ryder never gives the concert. The obvious major influence hanging over the book is Franz Kafka, although Lewis Carroll deprived of his whimsy and delight makes a strong argument for himself, too. It’s also hard for me to think that Ishiguro has unknowingly given his character the same name as the hero of Evelyn Waugh’s Brideshead Revisited, another feckless and second-rate artist who is unhappy in his personal life. But whatever the relationship of Ishiguro’s Charles Ryder to Waugh’s Charles Ryder may or may not be, and whatever relationship The Unconsoled may or may not have to Kafka or Carroll, and whatever significance all the complicated, ambiguous goings-on in this 500+ page novel may or may not possess – the truth is I don’t care because I don’t think the novel rewards the effort required to figure it out. I have a couple loosely related reasons for thinking this. I’m going to toss them out and let you decide. Here they are. “What’s up with Charles Ryder?” is probably the big question about The Unconsoled. Does he suffer from a mental illness or some form of amnesia or dementia? Does Ryder have emotional problems that prevent him from connecting with other people? Is he just another hapless existential shadow wandering through a meaningless universe? Is Ryder a cubist construct of the conscious and unconscious mind intended to be part of a “realism taken to its extreme” project? Is his character a vehicle for expressing the instability and chaos that lie deep within seemingly stable human personalities? All of these explanations seem plausible but none seem more plausible than the others. Which leads me to the suspicion that Ishiguro thinks it is the reader’s task to make sense of the book, not the author. Some people like this. I don’t. Life is a complicated, frustrating, ambiguous experience of which it is my task to make sense. I’m on it. But I got my hands full just trying to make sense of my life. I don’t need Kazuo giving me duplicate homework. I actually think this is what The Unconsoled is doing. The problem is that while exploring emptiness and tedium is interesting as an idea for a book, and might make a great short story, it is not interesting AS a book – especially one that is 500 pages. And here’s a related problem. Right now, I’m looking at a kitchen full of dirty dishes I need to clean up before I go to bed. If I want to explore the emptiness and tedium of life, I can think of no better method than washing those dishes. As a bonus, when I’m done, the dishes are washed. At which point I could read a book that tells me something other than the fact that life can be empty and tedious, which – by the way – I already know because I just finished washing the d@mn dishes for somewhere between the 7,000th and 8,000th d@mn time in my life. I don’t think Ishiguro wrote a long, difficult book just because he wanted the prestige of having written a long, difficult book. First, Ishiguro doesn’t seem like that kind of guy looking at his body of work. Second, to say that would be to accuse Ishiguro of writing in bad faith, and I don’t know that to be true, and it may not be possible to know that about The Unconsoled. But I wonder if Ishiguro was tempted or influenced by the desire for the prestige, considering the result. Writers, despite our often shy reputations, are just as vain as the next artist, after all. 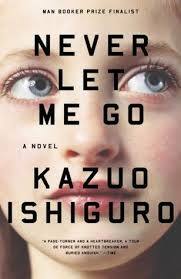 Maybe Ishiguro’s ambition was greater than his inspiration or talent. It happens all the time in novels. If fact, it might happen every time. That would make The Unconsoled an honest effort. But it doesn’t necessarily make it one worth reading.